The Royal Issues feature King Kalakaua, Queen Liliuokalani and Princess Kaiulani. 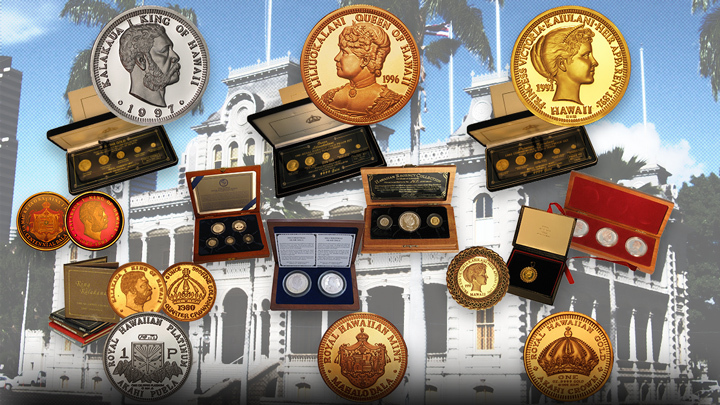 From Iolani Palace to the pageantry of the Kingdom of Hawaii with its silver coinage by King Kalakaua in 1883, the Royal Issues commemorate the most important events of the Hawaiian Kingdom in medallic art. From the stunning detail in the King Kalakaua, Queen Liliuokalani and Princess Kaiulani Gold five coin sets to the original Gold Crown design and the Platinum Puela by the Mint, the Royal Issues testify to the unique beauty of the Hawaiian coinage by the Royal Hawaiian Mint.